Discussion in 'Transformers Toy Discussion' started by Hyperoptic, Aug 24, 2010. I thought it might be interesting to see if anybody has old childhood photos of themselves opening transformer presents from Xmas or Bdays. I think I have some at my mother's place. So... Post'em if you got'em! If anyone could tell me how to take photos from a VHS, i'd post photos of me opening Trypticon. I must of been 4 or 5 and I freaked like a school girl lol. Can you capture the video with your PC? The darn tape doesn't fit into this cd-rom labeled drawer....stupid confounded contraption. 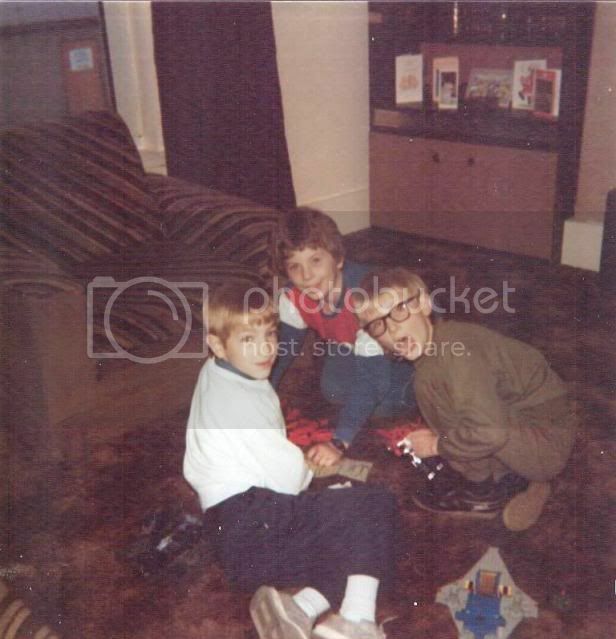 I've got a pic of one of my cousin's getting an Ultra Magnus in '86 ( I wasn't born until like 6 years later). I'll look for it tonight. Connect Four? He got screwed! Haha! No he didn't. My brother got Optimus Prime - it just wasn't in the picture. He does look pretty pleased with his Connect Four though. And I was just about to write that! Here's the only pic I got of me! Oh, and to the guy with the VHS problem, find a computer that has a composite input (red, yellow, white inputs) and plug the VCR into the computer and capture with Windows movie maker, or Quicktime if you are on a mac! Never took pics with my tf's for some reason tho. Tho i had pics taken with motu n lego. This must of been my 10th birthday, got Jetfire! Also just about visible are Prime's trailer in the bottom left of the pic, and you can just see Cosmos in the bottom right. I'm the one with the glasses incidentally. Damn, earlier this year I was busy scanning billions of family photos into my computer. Sadly, no pictures with Transformers. But, I did come across a picture of my oldest brother building one of my very first radio controlled trucks. I know it's not a TF, but I'll post it soon. The picture was taken during our Xmas vacations at my grandmothers home in Miami back in the 70's. You were friends with Michael Cera? I actually have a VHS tape of me talking about & reviewing several transformers toys that got released in the 1988. I think I was about 4 or 5 years old at the time. the vhs tape is around somewhere in my parents house. next time I visit my parents house,I'll ask where the VHS tape is. Hahahah. Too Funny.. It does look like Michael Cera as a kid!! I know there's a pic of me opening G1 Prime, Christmas 1985, at my parents' house. I'll have to dig it out next time I'm visiting. So true! But Michael Cera looks like Michael Cera as a kid. I think the closest thing to a photo of me opening presents has to be me as a kid, wearing the Voice Changing Optimus helmet. However, I have been trying to find that pic for years. I believe it was for halloween, even painted my face a blue metallic color. *sigh* all these old memories I have been brining up today!